I am watching how the fiscal cliff unfold itself going into last day of the year. But as a trader, I also have a plan in mind going into next week. There will be 2 scenarios now. 1) The stock market might tumble if there is no fiscal cliff policy, whether partial or full policy. If the stock market falls, I would take any downturn as my chance to buy stocks that are cheap, but are good fundamentally, and that shows resilience amid the drop. As long as I go in before next Friday evening's US jobs reports is fine, as I anticipate Jobs Reports next week to be better than expectations based on our research. Friday's Non farm payroll and Wednesday ADP employment report should show a better than expectations report. 2) If stock does not fall down the cliff on Tuesday, but rises in the event of any surge in confidence over the fiscal cliff policy, I would take the opportunity to go in on Wed American market or Singapore market. Even if stock market tumbles big over the fiscal cliff incident, this is just one chance for me too good to be missed. The more the market falls over the cliff, the better it is as I anticipate economical reports to be good and stocks' earnings reports to be excellent in january! I am aiming for a big HONGBAO from the stock market in february! Do you remembered our last article on 11 Dec: All 3 singapore banks hit a major roadblock? 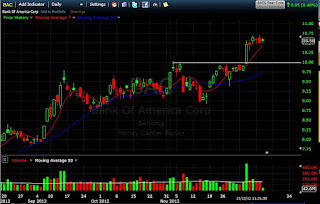 We mentioned that UOB resistance is $20, OCBC is $9.80 or $10(major resistance), DBS is $15. You can see that it continues to be a strong resistance! At that time, we encouraged you to use the banks as a hedging tool against your bullish positions going into the year end meaning short them. 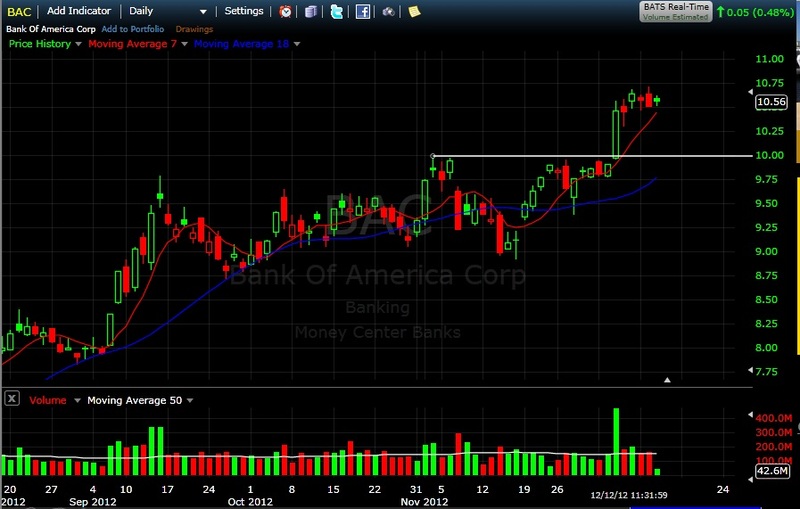 Till now, the 3 major banks have yet to break out of their major resistances. You probably can see them struggling. Today, UOB even cause a panic when at 12pm, it drop to $19.18 from $19.70 in a few minutes. I think this is caused by high frequency trading. But later on, it came back in the next few minutes. Conspiracy theory tells me a group of traders purposely attack this stock given the big surge in volume. Stop losses are taken out before market makers took over to push back the price. Here I would like to remind you that such attacks normally occur during lunch breaks just like the flash crash attack that happened to Dow Jones a couple of years back where in 20 minutes DOW drop by 1000 points. It happened on lunch time also. We are so so lucky and grateful for this wonderful Santa Claus Rally. A week back, we assured everybody do not sell into a panic when Dow drops by 200 points. We even mentioned it in FM958 when we were interviewed last week, to accumulate on the drop. 1) Blumont - We mentioned our target is $0.27 - $0.3. It was at $0.215 (18th Dec) when we publish. What is it now? $0.27-$0.3 i called it the watchful zone. Normally when price reach our watchful zone without showing strong signs, I would liquidate first and enter if i see strength again. Now for this stock, my strategy is to exit half since it reach our target and can't go past $0.27. But having said that, professional money has not left, i leave another half to run. Btw, upon breaking $0.30 i will see agian. Yesterday our first profit target of $1.59 (highest point yesterday) is exactly hit before retracing a bit. What is it now? For Ezion, I am a bit GREEDY as I see potential of it breaking $1.60. For this case I am aiming for my second target of $1.67-$1.7 where I would exit 100%. But now, Ezion I would move stop loss to $1.56 just in case market turns down. Professional money still inside stock. 3) Zhulian (malaysia counter) - We mention to enter 2 days ago when it is $2.72. We said that $2.70 is a support and we aim for $2.80 first target and second target at $2.95. What is it now? First we put our stop loss at $2.80 to guard our profits just in case! Next I will watch closely what happens at $2.95. 4) Utd Envirotech - We mention that there is accumulation when we spotted it at $0.44 on 21st Dec. It almost hit our first target of $0.5. Now is $0.485. We said our mid term target is $0.60 if we see that the players did not distribute the stock at $0.50.So we shall monitor closely at $0.50. 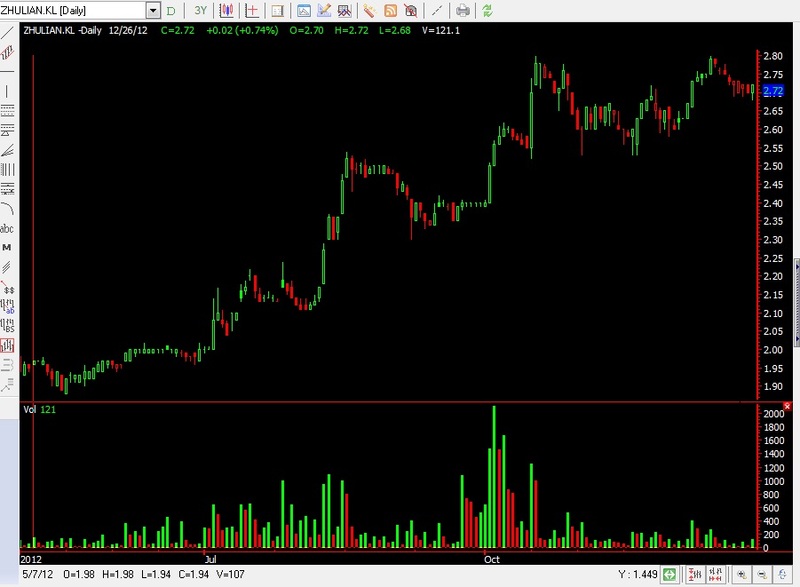 But now, we put stop loss at breakeven and let it run.... for this stock, I think the players might be in for a longer duration, so I shall hold with them till they run! 5) Yoma - One word, WAIT! By the way, don't tell anybody about this stock, the less people know, the better. Bcos the big players might be watching our facebook group or forum or media articles... I know that a lot of training schools are recommending this stock. So I think that is the major reason this stock has consolidated more days than the others. They are trying to wear down our patience! Btw, this is one major concern we have when it comes to issuing tips on stocks. My mentor, Mr Hu Li Yang (Asian Leading Investment Guru) once said, "The more a public figure you are, the more you should not talk about stocks. Bcos the big players are watching, they will one day make use of what you said to play against bcos of your influence." Do take note that investing is FUN if you know the way!!! Do come to our preview sessions to learn how to pick the right stocks! Hope you make $ these few days and enjoy the holidays!!! Seems like Zhulian is in accumulating now. My favorite stocks are trending up stocks like this. From a technical perspective, it seeems to be resting in a base at $2.70. Price today is $2.72. Likely to go up still in the short to mid term. If it goes up, first small target is $2.80, if it breaks, my second target is $2.95. Btw, we are still bullish about KLCI before election day (probably in May?) like what we have said in our past article. The recent correction of 5% from its height is what we think a bottom. A cliche in Wallstreet you may have heard of is what we called the year end Santa Claus Rally. Statistics have shown that santa claus rally start on the last 5 trading days of the year and ends after the first 2 trading days in January. It has been an average of 1.6% gain since 1969. Stats have also shown that if Santa Claus Rally does not happen, chances are high that next year might be a bear market or a bad year. Examples of down santa days are year 2007 (start of sub-prime), year 2004 (Middle East Terror), year 2002 (Nasdaq collapse). If indeed S&P500 did rally in the last 7 days, chances are high that 2013 might be a good bullish year. So let us keep a close lookout on the S&P500. For Singapore market, the STI has shown its resilience again after being down for a couple of days. But we have to remind you that STI might face a resistance between 3210-3240 region. Let us see how it performs once reached. By the way, stats also shows that Nasdaq is up 11 of last 12 times on the last day of december. Good to enter some nasdaq related stocks on the 2nd last 2 days. It has been a blessing year for us with you around. Thank you for your support! 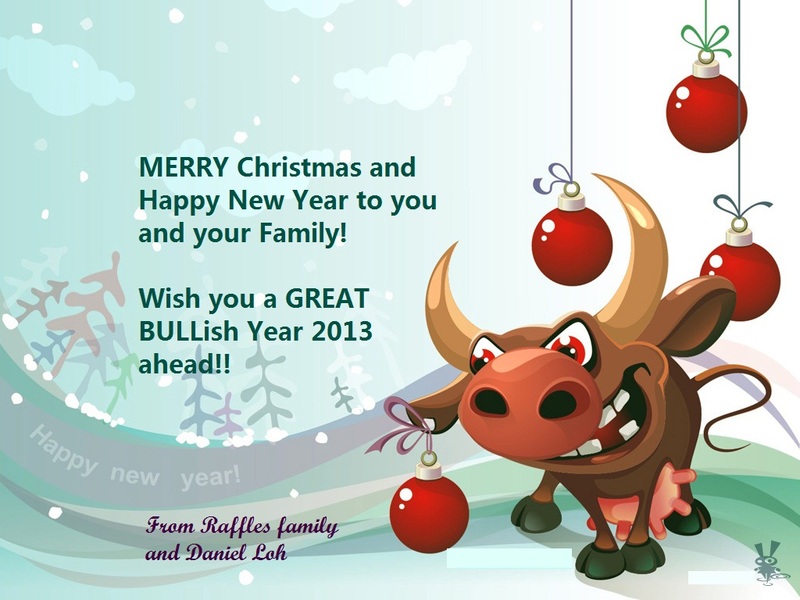 From the family of Raffles Business International, we wish you a wonderful Merry Christmas and a Happy New Year! Next year we Huat (Prosper) again!!! 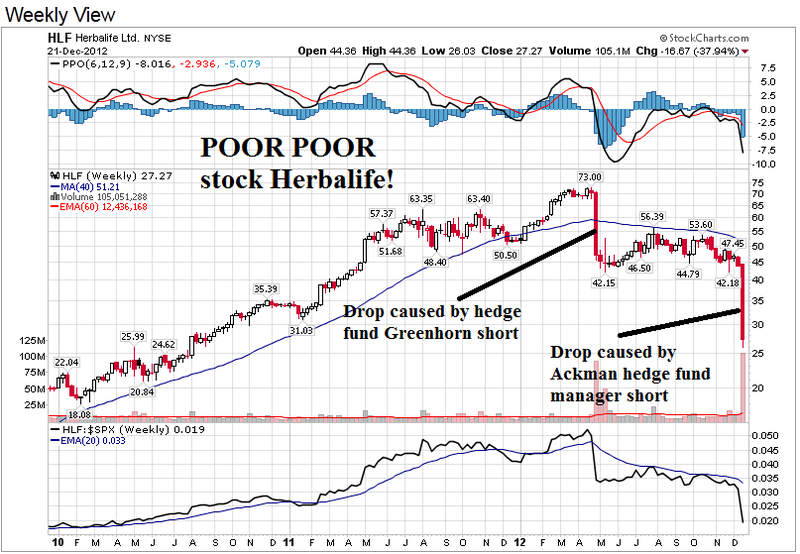 The Most Innocent company in America - Poor poor Herbalife! In Singapore, we have Olam. In America, we have Herbalife (HLF). The thing is herbalife suffered the same fate twice! Another $20 drop in one week! It happened to them in April and last week. Blame the shorting hedge fund managers! 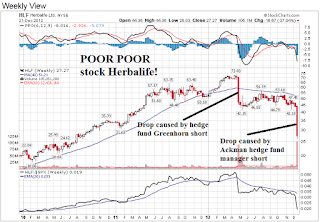 This year 2 well known hedge fund managers both questioned herbalife business model. Greenhorn and Ackman. It is amazing that Ackman calls the company "pyramid". Sigh, i thought MLM has been around for ages, and it is not like herbalife is a new MLM company. They also did not change much of their business plan. Ackman actually bought huge amount of put options a few days before! This is all planned in advance. Some of our friends asked about whether can invest in this company. My suggestion is to wait for the short to subside and wait for its next earnings to prove itself. Short term it is never good to go against the hedge funds who are shorting the stocks. My opinion is next time you see a hedge fund manager like Ackman or Greenhorn talking badly about a company, just short with them! In America, they have hedge fund conferences whereby these sharks will make their presentations. And these 2 guys are famous to make a lot of pages of info why they short the companies! Just short with them wont be wrong. Singapore Stock Tip: Who is buying this stock - United Envirotech? It is clear that there is someone gulping up this stock shares recently, a clear sign of accumulation for a penny stock. If nothing happens, it should go up until that "someone" distributes his shares. Let us see if he distributes them at $0.50. If he didn't, my mid term target after it breaks $0.50 is $0.60 for first target profit and $0.67 for second target..
We all know that by the mid noon today, Dow futures has dropped 190 points. STI drop by 7 points, KLCI by 7 points, Shanghai by 11 points and Hang Seng by 174 points. Some of us lament at a drop but we encourage you to like down days too. Because down days are always a FANTASTIC chance to know which stocks are resistant to the drop. It is a fabulous chance to know whether professional money are leaving the stock. 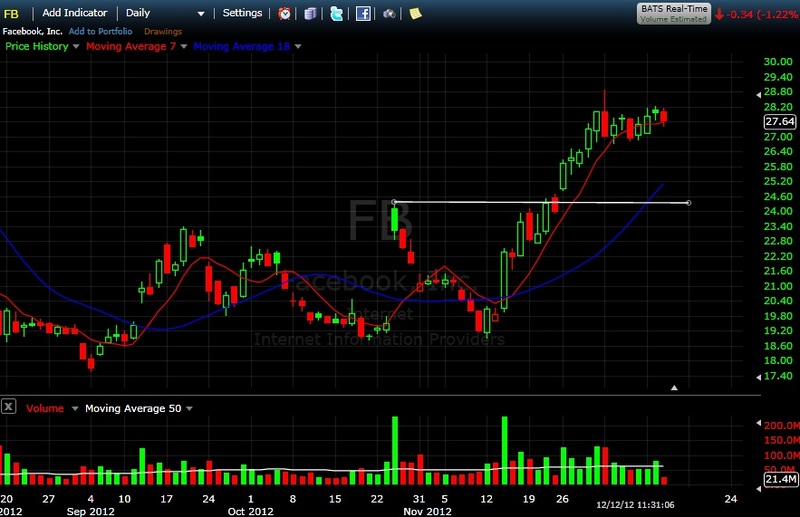 It is the best chance to know whether your stock has room to go higher. It is the only chance to catch a stock that you may have seen galloping off recently. It is normal that the rain appears before the rainbow. In stock market, volatility always appears before the D-Day. Just make sure the volatility does not scare you off in panic, because you are just 5 minutes away from the rainbow at the end. Let the US congress worry about the fiscal cliff, let them worry about it over their christmas turkey dinner. In the meantime, let us enjoy our christmas and holiday season! Looking at Yoma's drop today, it does still look a healthy accumulation stage. The general market is taking a rest today although STI goes up 10 points. Some index stocks are contributing to the run-up. OSIM drop today is unhealthy. Gap up today to 1.8 plus and drop till 1.75 now with a huge volume. 1.8 remains a resistance for this stock. Do remember we are not contra trading. You probably need to hold on to the stock. Do Join our FREE Seminar on Thu(华语) to learn how to capture the opportunities leading to Christmas!!! - Will there be a bear market coming next year? - What are the sectors in trend and having seasonal effects? 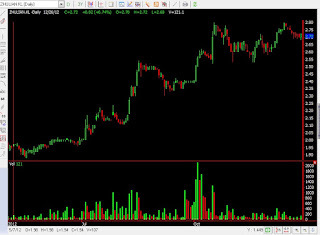 - How do you know when a consolidation is ending and when to enter? - Will there be a China turnaround story happening? - Making money from commodities or property? Anybody still questioning about the bullishness of the market? With Dow Jones increases 116 points now, more than triple digits 2 times in a row, who still thinks that we aren't in a bull run? Like what we did mention 2 days ago, we assured that this bullish run engine has just got started. We should take the opportunity during last few days drop to accumulate at any time instead of selling away into panic that market might consolidate. 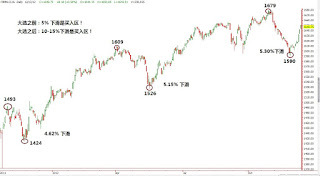 By studying the intraday directional movement of the index and the how many points Dow closes everyday and how the index reacts to the bad news and good news will give you the real indication of how bullish a market is. Combining with the confidence from Wallstreet over the fiscal cliff issue, let us ride this bullish run till it is gone. To me, market can't drop much now. This is the best time to get in the bandwagon! Christmas carol is in its best tune! Let us rejoice and celebrate now till santa comes to town!!! 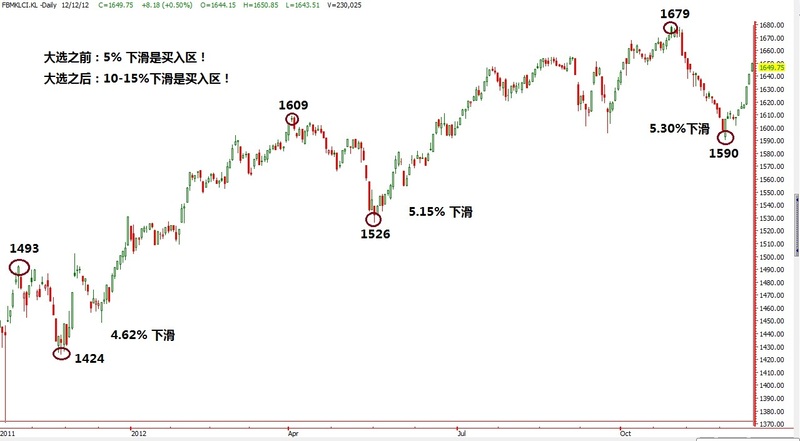 In the next article, we shall discuss about the famous january effect and the famous first 5 days of the year indicator which is supposed to give us the direction of the year! Singapore Stock Tip: Ezion gaps up, where is my target? Hit a jackpot again! 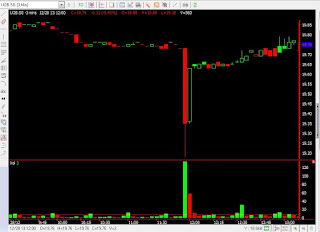 Ezion after trading halt gaps up 4-5 cents now. Now some of you may ask, what to do? If you have gone in like what we mentioned last thursday, you may have earned around 10 cents now. Now use money management to guard your exit. Today Yoma shows the run is still on! I have received questions on this stock. I think the run has not ended with yesterday drop. Professional money is still inside the stock! And if it touch $0.74 this time, it should break but next resting place is between $0.77-$0.80. Singapore Stock Tip: SuperGroup on the run now, Go Ezion and Ezra! Supergroup $3 support seems strong and probably will continue to carry forward now. Price is $3.14 now. But bear in mind, $3.3 is still a resistance. Do take note of tricky prices at $3.20 and $3.25 also. If all goes past, $3.47 is my target. Today Ezion and Ezra continue to run up as mentioned last Friday. Singapore Stock Tip: Did you pick up Yanlord like what we mentioned yesterday? Yesterday we advised on Both Ezion and Yanlord. Today Yanlord continue its momentum to burst thru the $1.50 resistance with a 7cts move... cool??? Have you made some $? Now hopefully Ezion follows the same path. My Ezra also running ;) ....Ezra I am targetting $1.17-$1.20, whereby it will need a rest. 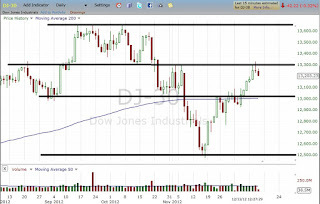 DOW did meet a short term resistance at 13300, but we don't think this run has ended! Now Dow has fallen by near to 60 points in mid day. Some of you might think this is the end of the bullish run. Mid term wise, we think this bullish run has just warmed up its engine only, possibly will march higher into january earnings. But as there have been so many consecutive up days, a small rest is always needed. This is where experienced players differentiate from the amateurs. Spotting market confidence will tell you to enter at the consolidation or run away with fear! 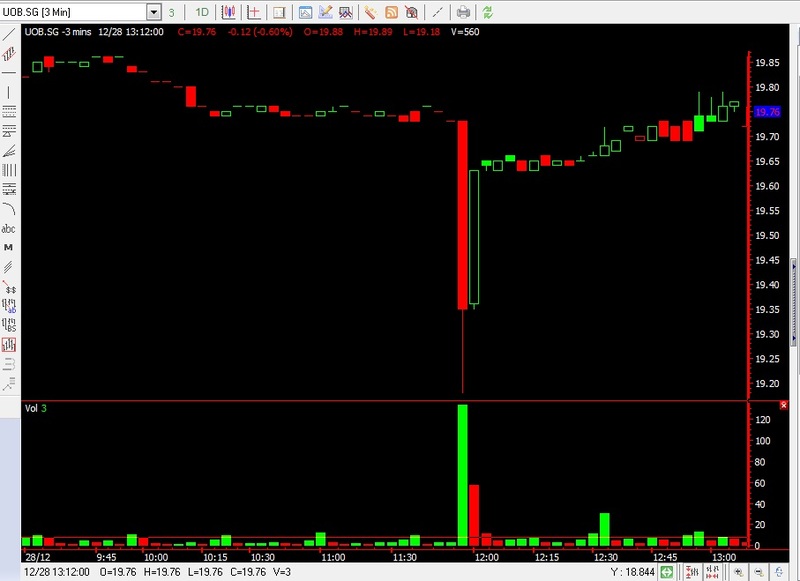 Look closely at how the market react to news and whether there is a sudden panic will tell you whether Dow might have a small 100-250 points small consolidation or a big 700-1000 points drop. Look at whether Dow has a 100 points drop will indicate how bearish the market is. Look at how Dow opens and closes at the end of day will tell you how powerful the bears are. Look at how the media paints the bearish news and how the market reacts to the news will tell you about the market confidence. Just a note, do not be scared by news as news and reaction give us a glimpse to the market sentiment. Learn to embrace down days just like up days as they will tell you whether this run is real or not! I was late to check on our market sentiment indicator recently because I was on holidays last week. But today when I checked, our indicator told us that both tech sector and S&P500 stocks have already turned bullish. Tech sector has turned bullish on 5th Dec while S&P 500 index on 11th Dec. This is great news for the stock market. Mid term wise, be wary of shorting the stocks now. Do remember that tech sector is the first sector that bring US market to its knees in October. Good that now it has turned bullish. In one of the articles that we wrote last month, we mentioned that tech sector is the sector to watch out going into January. It seems to follow according to our plan. Normally when one sector starts to change trend, other sectors like oil and gas, or financial sector, or healthcare will follow. Then the whole NYSE or Nasdaq stock exchange will follow. Hence mid term wise, do take note that we are turning bullish and I predict that this bullishness has a chance to continue into next earnings season in January. Do take note that our market sentiment indicator has been spot on this year. Hence any shorting position should be treated with caution now. Dear Daniel, your site is very insightful and I enjoy reading it. Can you please comment on olam because a lot of shareholders would like to know if they should dump their olam shares. Many thank. Thank you! Olam is really a difficult subject as this stock involves a lot of uncertainties. Short term wise, I have not seen players coming in to accumulate the stock. Do remember that short term players like us don't like uncertainties. Even if this stock break the $1.70 barrier, I would not want it in my portfolio. Long term wise, I think Olam might be cautious about their next earnings report now. Although they are one of the fastest growing company in singapore with a high growth rate, they may tone down in their coming earnings results which might inevitably lower their earnings. This is something that investors need to take into consideration whether to hold a not. There are better companies out there with good earnings and trending up for you to switch to. For me, I will switch my portfolio for others. If Olam revives again and you want to gamble, then come back at a later stage. 1) We did mentioned about OSIM. 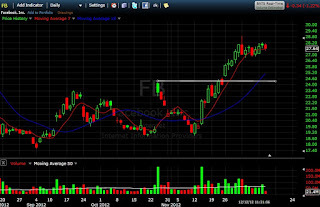 We did exit recently when it hit $1.80, a resistance after profiting from a 10 cents play up. But these 2 days, I notice that it is likely to trend higher. So we might likely take up a second position. Our next profit target at $1.90. 2nd profit target I aiming is $1.97. Stop loss now is at $1.77. 2) Tat Hong is also consolidating. We believe it can challenge $1.40 soon. If break, $1.47 is a must run price. 3) For Yoma, you can see this stock is consolidating between 69 cents and 74 cents. Has a chance to go higher. If you have this position, continue to hold. Stop loss at 67 cents. If you have not entered, wait for it to show momentum. Market back on top gear after a fight! Are you in? Do you remember that 3 weeks back, a lot of the folks are still worried of the fiscal cliff incident? People are still worried that the economy next year is falling down the cliff, and even some in Wallstreet are very sure that the republicans and democrats can't solve it in time. Looking back, don't you think that this is a great opportunity missed? While people are lamenting and doubtful about the market, we have made quite some money from the market. Lesson learnt here is not to trust the media. 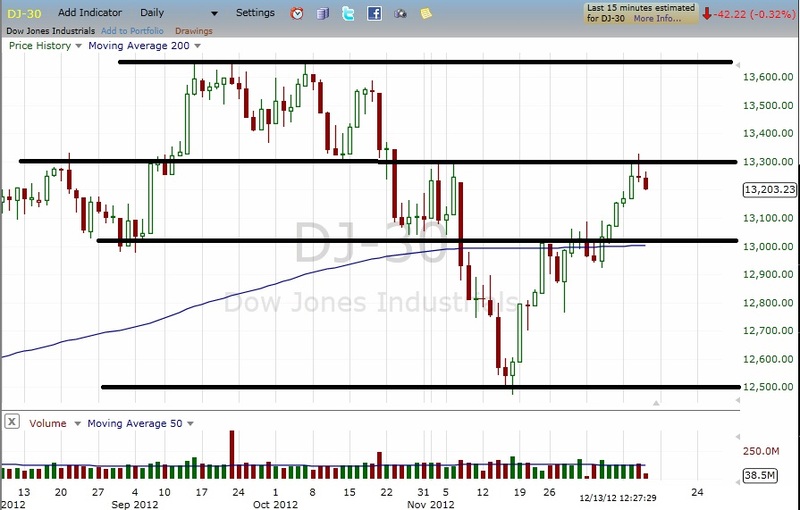 Learn how to study the market sentiment and confidence. On 26th november, we mentioned that the retail spending is up with the best post thanksgiving shopping - Black Friday ever. It indicates bullish sentiment among americans. Do they care what cliff or mountain there is? And I believe that next earnings season in january will be a blockbuster, and I continue to believe so. Watch out for tech and internet sector! Watch out for Apple earnings this time! A potential to FLY! 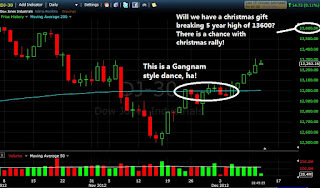 On 28th november, we did say that dow is waiting to break 13000 in gangnam style, meaning dancing around before breaking the resistance and also the 200day MA mark. We assured that just by studying the daily movement in the index, you will know whether market is positive and optimistic or not. How it close is one way of knowing it! 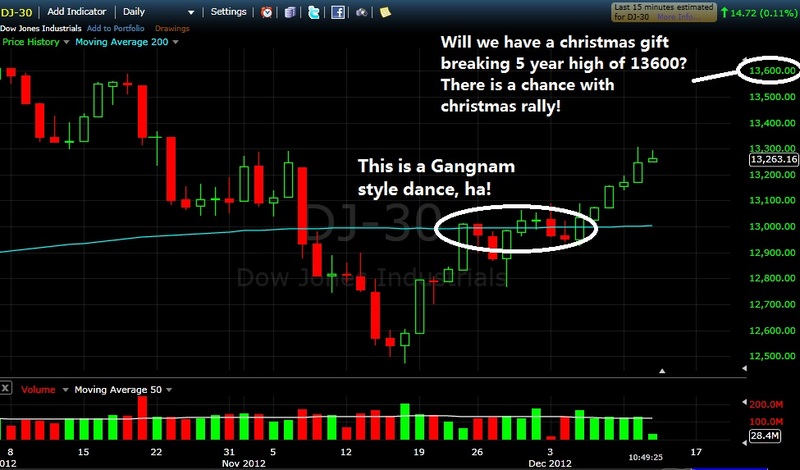 A look at the Gangnam style dance again off DOW 13000 and 200day MA! On the 30th november, we wrote an article about the fiscal cliff controversy, reminding all not to guess too much into whether there be a cliff or not. Just focus on the expectation of Wallstreet and your strategy. Controversy always happen in the market. It is how we study the market confidence and sentiment that matters. Don't be a politician or media! Be a trader! Having said that, I would like to share something that perhaps nobody has yet to comment. Do not think that if the fiscal cliff policy is out, stock market will continue to burst forward! Don't fall into the media hands again! If this stock market continues to burst forward, when expectation has already been factored into the market, whether got policy or not, it is bound to consolidate. Do not be a FOOL to rush into the market then just like the QE3! Buy on expectation and sell on news should be our game! You are just playing into the hands of the pros who are always one step ahead of you if you are slow in the game. If you would like to make some money. start now. P.S. Do take note that STI will have a big resistance at 3200 - 3240. It won't past that easily.